The Carter years were tough. They started out well. The recovery from the 1973-1975 recession brought unemployment down and incomes up. But all this was undone by the return of inflation. By 1980, when inflation reached its peak, unemployment was rising, interest rates were at their highest levels since World War II, productivity growth had slowed, and business investment was falling. Fear ruled the markets, a “crisis of confidence” ruled the people. Venture capital had a different trajectory in the 1970s: until 1978 there was almost nothing, then suddenly, it took off. The pioneers of the 1960s and 1970s had figured out a winning formula: build a great network to source opportunities, spend months getting to know the management team and doing due diligence, invest at the earliest possible stage, work hard to help founders get the right team in place and put together partnerships, and take the company public only when it was ready to be a public company. The result was that, despite an IPO market that had virtually disappeared, iconic VC-backed companies made it out into the market. Cray and Tandem in 1976, Evans & Sutherland and Federal Express in 1978, and Apple and Genentech in 1980. The Reagan years looked promising. There’s so much money chasing these deals that venture capitalists are in competition with each other. They spend their energies marketing themselves instead of screening the deals. It’s gotten silly1. Money had been pouring into venture capital since a 1978 change in regulations allowed pension funds to consider it a “prudent” investment. The $2.5 billion managed by venture capital firms in 1977 quintupled by 1983 to $12 billion2. New money committed per year rose 16x over five years, from $218 million in 1978 to $3.6 billion in 19833. 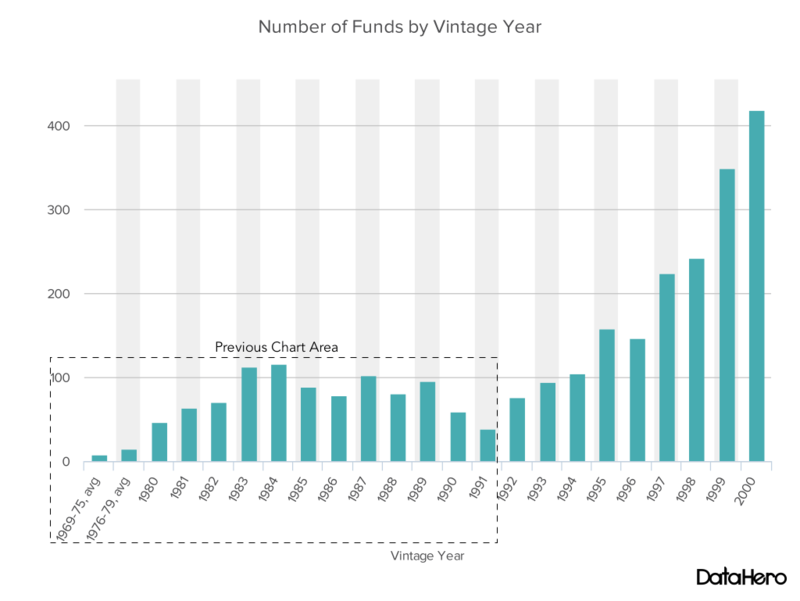 The number of venture funds grew from 47 in 1980, to 71 in 1982, to 113 in 1983. The number of investment professionals nearly tripled, from 597 in 1977 to 1,494 in 1983. The economy started to improve. The new Federal Reserve Chairman Paul Volcker, appointed by Carter in 1979, had taken the politically unpopular move of raising interest rates to combat inflation, to 20% by mid-1981. It was painful, but it worked: by 1983 the decade of stagflation was over. The IPO markets celebrated with their biggest year since 1969. A Carter appointee had delivered on Reagan’s promise: it was Morning Again in America. Venture investments got competitive, and more expensive. “We have less time to make up our minds,” said Eugene Kleiner in a Wall Street Journal article, “It used to be that you had two or three months. Now it’s a matter of weeks or even days, because if we don’t somebody else will.”4 VCs started to invest ever earlier in a company’s lifecycle to try and avoid competitive term-sheets. The later stages of financing are becoming very crowded, so the best opportunity is to come in with seed money, or to invest even before the company has a business plan5. Prices for startups rose. “The price tags on such companies are running from 20% to 100% higher than last year’s first-round financings,” said the Wall Street Journal in 19816. Some attributed the rise in prices to lack of experience. Almost two-thirds of VCs in 1983 had not been in the business five years before, they had very little venture investing experience. And yet the amount of capital each managed doubled, on average, from $4 million in 1977 to $8 million in 1983. So the 1983 IPO window was a godsend. Amgen, Biogen, LSI, Apollo, Compaq, Lotus Development, Businessland, Trilogy, Stratus, Paychex, Chiron, and a host of other VC-backed companies went public in 1983, far more than in any year previously. Industry folklore reported investment returns of between 30-50% per year8. It was a watershed year for venture capital. Naturally, that’s when things started to go wrong. In 1984 companies suddenly found it was again hard to go public. 1986 was a bit better, and firms like Microsoft, Oracle, Sun, Adobe, and Cypress Semiconductor took advantage of the opportunity, but the IPO market grew sluggish again after that. 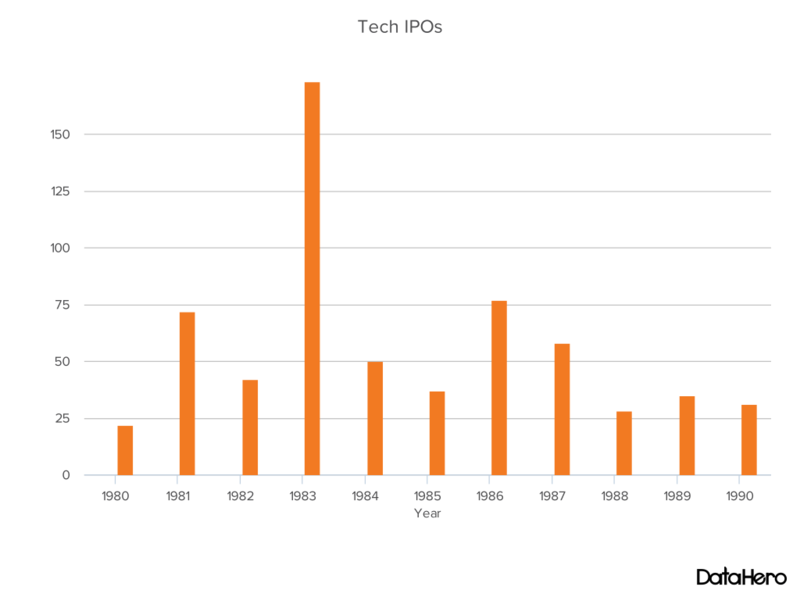 Tech IPOs peaked at 173 in 1983, a level they would not reach again for twelve years. Venture returns started to fall. From a peak of about 30% median IRRs in 1982 and 1983, IRRs slid all the way down to about 8% in 1988. Source: Gompers, “Rise and Fall”, op cit. The drop-off was entirely attributable to recently raised funds. Returns from funds raised in 1980 peaked in 1983 with an almost 20% cumulative return (the pre-1980 funds did even better.) 1981 was respectable. But funds raised in 1982 and after showed abysmal early returns through the ’80s. Observers started casting blame: frequently on venture capitalists paying too much, or on inexperienced VCs. Overpaying is an obvious explanation. Increased competition for deals may have driven prices up and returns down. But high prices in the early ’80s can’t account for the poor return of later vintages, so that can only be part of the explanation. It’s also easy to believe that newcomers might just not be very good investors yet, that they would need some time to learn how to invest well. But poor returns weren’t limited to new VCs: returns broken out between first-time venture funds and follow-on funds show both the noobs and the experienced producing similarly dismal results9. The poor performance of newer venture capital funds reflects that fewer companies are going public, and some are forced to go public at low prices10. New money managers have a unique problem, though. They need to show they can make their LPs money before they go to raise a new fund. They need exits. Some observers claimed that new VCs were “grandstanding”: demonstrating their ability to exit by exiting too soon, especially through IPOs11. By forcing their companies to go public before they were ready, they ended up with sub-optimal IPOs. This not only hurt the VCs involved, but it poisoned the well for other companies hoping to go public. But the biggest problem, in hindsight, was that the sectors that had produced the best returns in the early ’80s were no longer delivering. Investors scrambled, betting on any idea that showed evidence of being able to become a winning business, no matter if it was technology or not. The computer hardware boom had quietly ended as each category settled on an architecture. Soon after IBM released their personal computer in 1981, for example, the basis of PC hardware competition moved from product innovation to manufacturing and marketing efficiencies13. Scores of companies trying to define what the personal computer would be were whittled down to just a few trying to market slightly faster and smaller machines to specific markets at ever lower prices. From PC design innovators like Apple, startup activity moved to efficient manufacturers and marketers like Dell and Gateway. Like the mainframe and minicomputer industries before them, and with the workstation market right on its heels, the PC hardware industry had moved from radical to incremental innovation. So by January 1984 investors had turned away from hardware towards software. But these VCs were already late to the market. By 1984 the big software wins of the 1980s were already founded or public. Computer Associates (founded 1974) went public in 1981; Lotus Development Corp. (founded 1982) in 1983; VM Software (founded 1981) in 1985; Adobe (founded 1982), Oracle (founded 1977), and Microsoft (founded 1975) in 1986; BMC (founded 1980) in 1988; Electronic Arts (founded 1982) in 1989. Over the past five years, venture capitalists have been chastened by large losses on an estimated $500 million in a dozen now-unsuccessful makers of mini-supercomputers16. Biotech, the great hope of the end of the ’70s, had fallen out of favor; progress was slow: the 1989 revenues of the top ten biotech companies was less than $1 billion in aggregate, with combined losses of about $33 million17. Pen-based computing, interactive television, and superconductors did not pan out. Parallel computing was too early18. The disk drive industry (called then “Winchester disk drives”) deserves a few paragraphs just by itself19 because it illustrates a recurring theme: VCs reacting to a few successful companies by massively over-funding the sector. The success of one company in an area such as disk drives or semiconductors immediately spawned a plethora of me-too deals in the same business20. The disk drive industry had been rapidly growing for several years. Few PCs had them in the early ’80s but they became standard as prices dropped. Between 1978 and 1983, sales in the OEM market grew from $27 million to approximately $1.3 billion, and were projected to continue growing to $4.5 billion by 1987. Companies like Memorex, Control Data, and Storage Technology were big winners. When it became clear how well they were doing, more companies were formed and funded. Dave Marquardt…made a half-million investment in Seagate in May 1980. When Seagate went public in the Summer of ’81, that half-million was suddenly worth twenty million21. In 1981, 12 disk drive companies were founded and received venture capital. 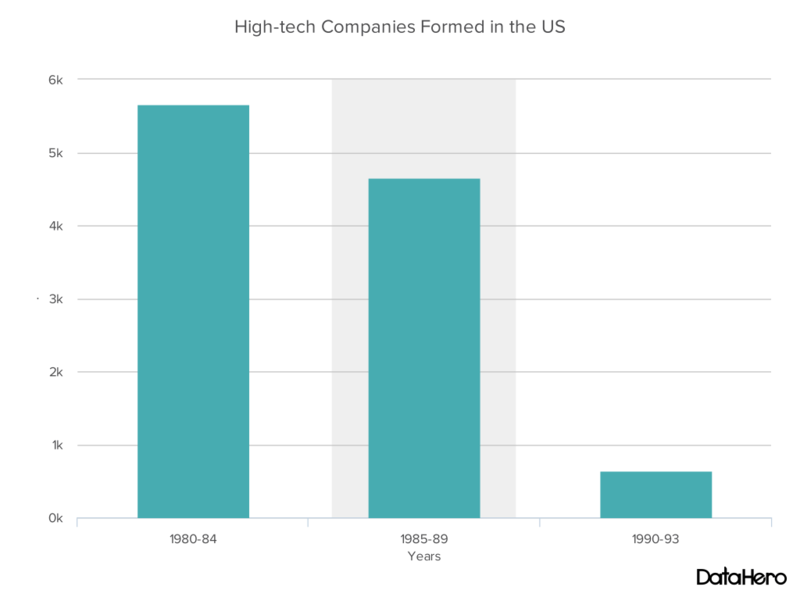 In 1982, 19 companies; in 1983, 22 companies. Almost $400 million was invested in the industry between 1977 and 1984, $270 million of that in 1983 and 1984 alone. By 1983 there were more than 70 companies competing in the industry. In response to the increase in competition, prices were slashed and margins fell dramatically, but fixed R&D expenses did not. The valuations of these companies collapsed. There are more than 64 floppy-disk makers. Perhaps that’s too many. That’s just a personal observation. Venture investors have always flocked to sectors that begin to show promise. There were a plethora of funded PC manufacturers, for instance. Individual companies in these over-funded sectors still succeed23, but overfunding causes overall low returns. In the 1980s this was exacerbated by the sheer number of new VCs, their fear of missing out on what might be a career-defining win, and the few promising sectors that appeared. There are fewer high-tech deals that are perceived to be hot. In retrospect, we can see new areas on the horizon: Cisco was founded in 198425, AOL in 1985; Thinking Machines unveiled its first massively parallel computer, the Connection Machine, in 1986; but it was not obvious at the time how these ideas would generate new markets; it was too early. Speaking at the 1990 Venture Forum, John Doerr of Kleiner Perkins illustrated the industry’s frantic search for an innovative sector that could sustain it. The business grew too fast, there were too many people trying to do technology start-ups. [Doerr] went on to contend that…pessimism is all wrong because the business is not a zero-sum game and several significant trends will create opportunities for billion-dollar companies in the 1990s. Doerr believes the most promising opportunities include instrumentation for human gene screening, the development of more effective pharmaceutical products for the aging population, a new generation of audiovisual, pen-based computing, new discoveries in neurobiology, and automated designer chemicals27. If an interviewer asked John Doerr a few years later about the most promising opportunities, he would have had a clear and concise answer (Doerr backed Netscape and Amazon.com in the early ’90s.) But between 1984 and 1992 there was no clear answer. Pension funds and others who stake VCs can’t really know how poorly their venture investments are doing until years after the fact. So even as returns on recent funds went negative in 1985-1989, money kept pouring into venture; VCs had to figure out something to do with it. You might as well go for the safer and more current return because you do have the time value of money. I am being penalized for being a long-term investor. VCs figured that, absent blockbuster companies, IRRs could be improved either by shortening holding periods or having a higher company survival rate. Despite learning in the 1970s that early-stage investing is where the returns are, firms in the 1980s started to invest at much later stages and in already-established markets. The venture capital industry, which has nurtured the growth of hundreds of high-technology companies such as Apple Computer, Genentech and Lotus Development, is shifting its focus to more mundane investments that have little to do with technological innovation or creating new jobs. Discount stores, pizza shops, athletic apparel concerns and a host of companies that provide personal and business services are increasingly competing for funds with biotechnology ventures and computer concerns. At the same time, more than a third of the $3.4 billion raised by venture capitalists last year  appears to have been earmarked for leveraged buyouts, in which loans used to finance the acquisition of a company are secured with the assets of the company being acquired. Such buyouts invest in established companies rather than underwriting new ones. America’s venture capital industry has been restructuring itself in a way that is eroding its historic role as a source of seed money…venture capitalists have been putting a greater share of their money in later-round financings and LBOs29. 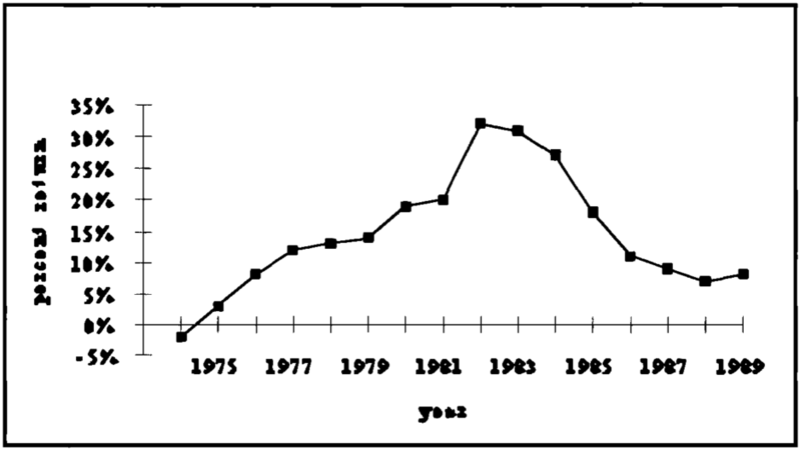 From none in 1980, LBOs grew to 23% of VC dollars by 1986. Seed and early-stage financing, once a quarter of VC investment, fell to 12.5% by 1988. Many of the top firms moved either entirely or partly to LBOs: J.H. Whitney & Co. (one of the original VC firms, in the business since 1946); Patricof Associates (Alan Patricof returned to the VC fold in 2006 with his current fund Greycroft Partners); Welsh, Carson, Anderson & Stowe; Warburg Pincus; Merrill, Pickard, Anderson & Eyre; Bain Capital; and TA Associates were some of the more prominent. Even Sequoia started backing LBOs. Even when VCs were investing in startups, the companies were unlike the ones that had generated the phenomenal 1980 VC returns. The new wisdom was to lower risk by investing in well-understood, slower growth markets. VCs also limited risk by shunning technology. VCs backed companies like Staples (founded 1985) and Starbucks (founded 1985), despite their high capital requirements and lack of barriers to entry. As in the high-tech sectors, initial success was followed by over-funding. Top funds, like US Venture Partners and NEA, moved “from their traditional high-tech portfolios into specialty retailing and consumer product investments.”31 VCs had always backed retail companies (Jiffy Lube in 1979, for instance) but the volume of these deals increased. Consumer was the largest single VC investment category, by dollars, in 198432. 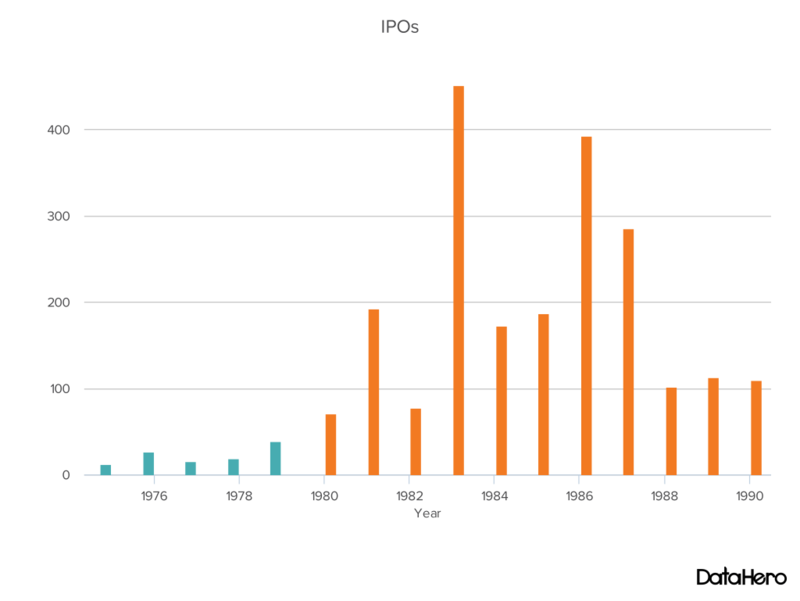 And it was the largest category of VC-backed IPOs in 1984, 1985, and 198633. One unnamed venture capitalist said in the Journal “Although the prospects for unusually big hits like Apple and Sun are small, you can get good results with greater consistency.”34 This turned out to be wishful thinking. 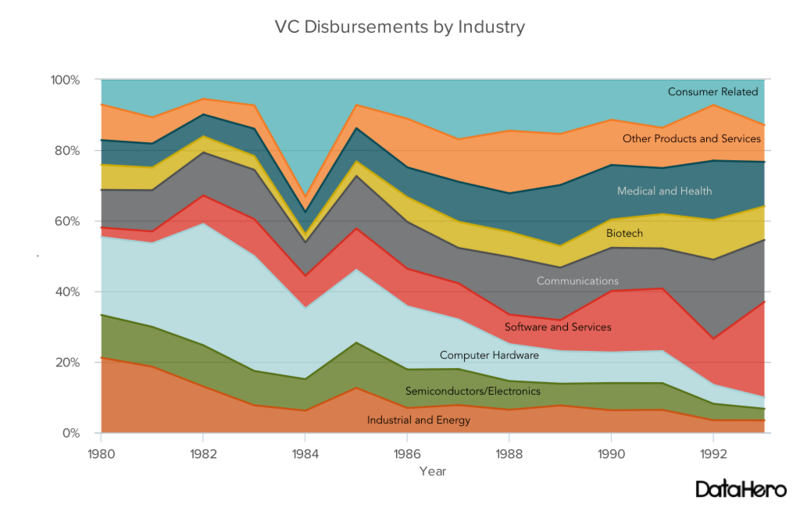 While consumer related and ‘other products and services’ grew as a percent of VC disbursements, semiconductors, computer hardware, and communication shrank. Software and services did not start to take off until the ’90s. By the end of the decade venture capitalists started to admit that the attempt to create predictable returns had failed. VCs disliked high-technology because the high-tech sectors of the day were poor candidates for venture. Investments in cable-TV and cell-phone infrastructure could never have achieved the types of returns that an Apple Computer or Genentech did, because they required so much capital. (Even though capital-intensive companies like Federal Express had gone on to be successful IPOs in the 1970s, they were still bad investments for their early backers35.) Early stage investors, what few remained by the late 1980s, lowered their sites to avoid being crushed by future capital requirements. In biotech they gave up even trying to build self-sustaining companies that might one day go public. The VC investing landscape had, essentially, bifurcated. One group of VCs made small, earlier investments and tried to manage their risk by investing in established markets or by building products, not companies; another group made much larger, later investments and tried to manage their risk by investing in companies that were not “startups” at all. The number of risk takers is decreasing. Venture capitalists’ job is to invest in risky projects. But after shying away from risk for years, VCs finally found there was no longer anybody willing to found a risk-taking company. The number of high-tech starts plummeted. But, as every good contrarian knows, things are darkest before the dawn. There’s a big day coming, and I can hardly wait. – Yo La Tengo, 1993. It changed fast. A headline in the Wall Street Journal in August 1991 moaned “Venture Capital Funding for Small Companies Plunges.”37 A year later the headline read “Venture Funds Regain Appetite for Start-Ups.”38 Start-ups were back in favor. What happened? Well, you know what happened, the Internet happened. The technologies enabling “New Media” were not new. AOL and Cisco were both formed in the ’80s. The fiber optics that became the backbone of the “information superhighway” had also been laid in the ’80s39 and the multimedia capabilities of PCs were the result of years of work40. The catalyst for the 1990s revolution was the invention of the World Wide Web by Tim Berners-Lee in 1990. In January 1993, Marc Andreessen and Eric Bina released the first version of Mosaic, an open-source Web browser. Also in 1993, CERN announced the Web was free for anyone to use, at just the time when the NSF freed the academic Internet to connect with commercial networks. The 1990s had begun, high-tech was saved. Entrepreneurs and venture investors struggled to satisfy the appetite of IPO investors. They took startups to market before they had proved their long-term viability, and funded any startup that might be able to make it to the public markets quickly. Companies were funded with questionable markets, management teams, business models, and products. Regardless, venture investors often made good money on these short-term bets. 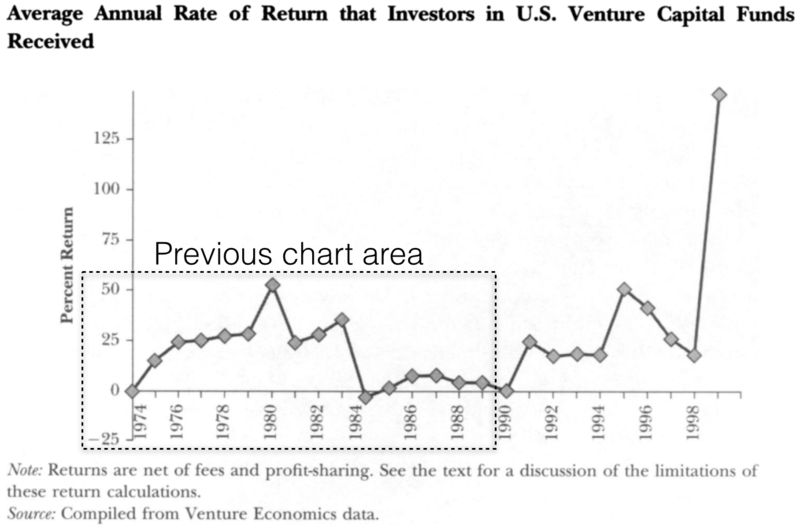 Venture returns hit heights they had never seen, not even in the high-flying ’70s. Money poured into venture at a rate that belied the 1980s warnings that the industry would need to shrink to prosper. And many more new funds were started to take the money. In March 2000, some investors realized that some of the public Internet companies could not, under any reasonable growth and valuation assumptions, be worth what the market valued them at. They sold, and prices went down. Other investors, seeing prices go down, decided to cut their risk by also selling. Prices went down further. There was a brief rally and then investors lost their nerve. On March 27, 2000 the NASDAQ, where many of the Internet companies had listed their stock, closed at 4,959. By April 14, less than three weeks later, it had dropped more than 30%, to 3,321. The NASDAQ lost half its value by the end of the year. It has never, even after almost 15 years, returned to the highs of March 2000. The ’90s were a bubble. Investors bought stocks because they could sell into a rising market. VCs backed companies because they could take them public. Everyone took brash product and market risks because the public markets did not care about these sorts of risks. But the ’80s were not a bubble. Not every cycle is a bubble. If the fatal flaw of the ’90s was hubris–“This time it’s different”–the fatal flaw of the ’80s was fear. Venture capitalists were afraid to take risks. Instead they invested in known markets, less ambitious entrepreneurs, and later-stage companies. But you can’t get great returns without taking big risks: risk and reward are correlated. In the ’90s entrepreneurs and investors took huge risks and got big returns. In the ’80s they tried to avoid risk and got nothing. Each type of risk has a different effect on VC returns. Technical risk is horrible for returns, so VCs do not take technical risk. There are a handful of examples of high technical risk companies that had great returns–Genentech43, for example–but they are few44. Today, VCs wait until there is a working prototype before they fund, but successful VCs have always waited until the technical risk was mitigated. Apple Computer, for example, did not have technical risk: the technology worked before the company was funded. Market risk, on the other hand, is directly correlated to VC returns. When Apple was funded no one had any way of knowing how many people would buy a personal computer; the ultimate size of the market was analytically unknowable. DEC, Intel, Google, etc. all went into markets that they helped create. High market risk is associated with the best VC investments of all time. In the late ’70s/early ’80s and again in the mid to late ’90s VCs were comfortable funding companies with mind-boggling market risk, and they got amazing returns in exchange. In the mid to late ’80s they were scared and funded companies with low market risk instead, and returns were horrible. Saying VCs used to take high technical risk and now take high market risk is both an overly optimistic view of the past–the mythical golden age of heroic VCs championing the development of new technologies–and an overly optimistic view of the present–gutsy VCs funding radical innovations that create entirely new markets. Neither of these things is true. VCs have never funded technical risk and they are not now funding market risk45. The VC community is purposely avoiding risk because we think we can make good returns without taking it. The lesson of the 1980s is that no matter how appealing this fantasy is, it’s still a fantasy. 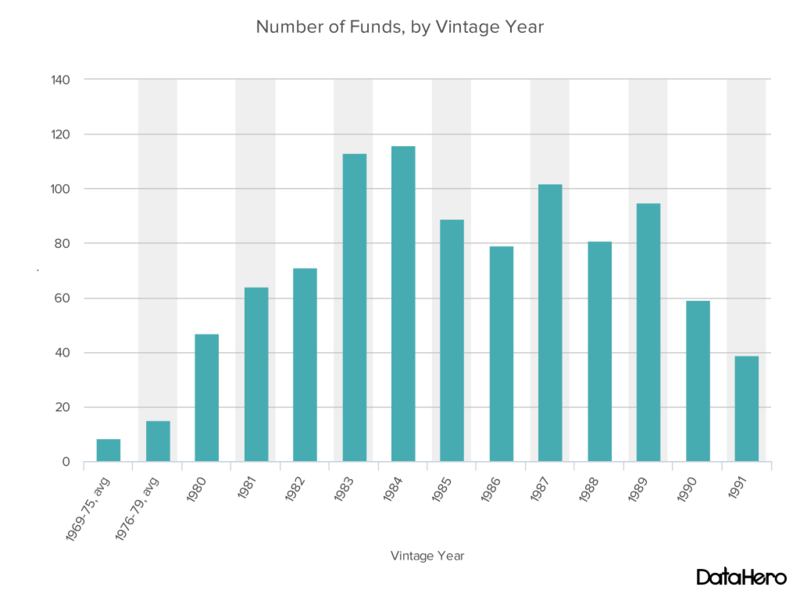 People in the VC industry talk about the ’60s, when institutional venture capital took off. They talk about the ’70s, when iconic companies like Apple and Genentech were founded and the microcomputer industry emerged. They talk about the ’90s and the Internet bubble. They don’t talk about the ’80s; the ’80s are the missing piece of the puzzle. You can have lots of plausible theories about what venture capitalists as a class can do to get good returns, until you take the 1980s into account. Then you can only have one: the only thing VCs can control that will improve their outcomes is having enough guts to bet on markets that don’t yet exist. Everything else is noise. The 1990s are not our map, the 1980s are. Don’t worry about irrational exuberance fueling a bubble, that is not what is happening. Worry about fear of risk. We know where that leads: once again straight into the ditch. – Thanks to Justin Singer for reading drafts of this and helping me think it through. Fascinating and fantastic. Thanks to both you and Justin for taking the time to do such a quality piece. I’m keen to read more. Are there any particular books / papers you’d recommend, either from those within your footnote or beyond? This is so damn good. Thank you. Interesting review of lots of history. If I had a couple of additions, I’d single out Gary Morgenthaler, who in the 1970’s almost single-handedly convinced Congress to reduce the capital gains tax, and really helped this industry at a key time. And I’d look at the one constant over the years, which is that more than 100% of the gains are posted by a very small number of firms or even investors. For decades, it’s been a very asymmetric business. Unbelievable good read. Couldn’t put it down. Thank you for the time and effort you (all) put into this. Thanks for pulling this together. Some of the analysis is particularly helpful in current circumstance. I will quibble, challenge, the early history suggestion that Volcker’s actions “worked.” This link to an article my father wrote as the Fed transitioned to Greenspan says it better than I might: https://gpbrockway.wordpress.com/2012/12/11/vale-volcker/. It examines Volcker’s Fed contributions in terms of five factors, (1) inflation, (2) general welfare, (3) economic output, (4) foreign trade, and (5) the deficit and then looks more closely at his underlying theory. Thanks for all the research. This has to be the single best “connect the dots” piece on the web! Outstanding read. Just wanted to say thank you for a wonderful article. Thank you for this. As someone who entered the VC funded high-tech business in the early ’70s and lived through much of this either as an entrepreneur or investor I think you’ve captured the most important features of the business and its cycles. At the root of what has happened is a fundamental transformation of a series of gigantic consumer markets by technology. While some of these transformations took place in the supporting infrastructure, the brilliance of some in the companies and investment groups is that they recognized that the infrastructure market would remain a small fraction of the size of the consumer markets it supports. What many have underestimated is the magnitude of the gains to be made through these consumer market transformations and how radically and continuously they can be changed. It will be very interesting to watch as this current pool of money is invested. In the 1998-2000 boom, VCs poured dollars into marketing in order to own a brand on the Internet, a brand for toys, for fragrance, for cars, for jewelry, for anything. The investments were often on top of non-existent business models. It was more important to own the brand in the new frontier because, with enough consumers, the business would work itself out. Then the bust. In today’s froth, scale has replaced brand as the reason to pour dollars into a startup. 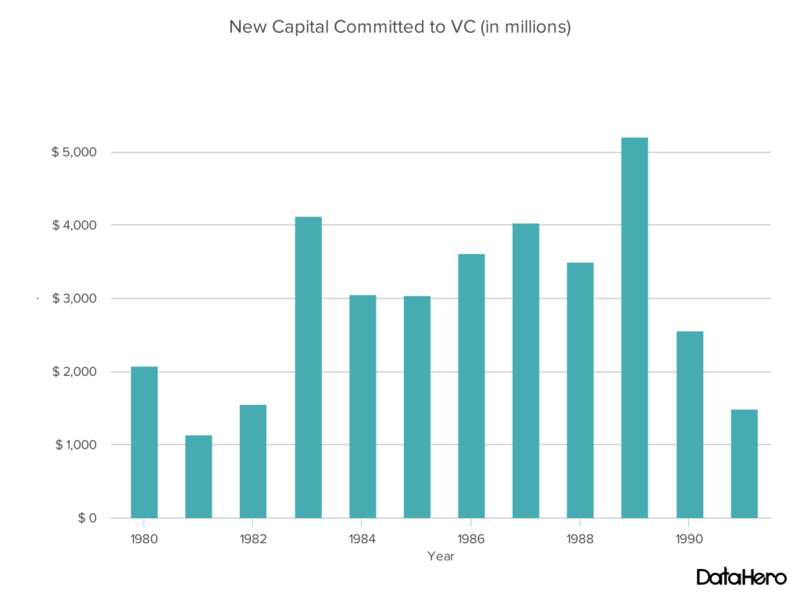 In spite of the enormous amount of available VC capital, there is not nearly as much need for capital now. All the infrastructure is in the cloud and the R&D timeframe is days and weeks to prototype, not months and years. Startups can test and refine business models for much less than $1m. To rationalize $1b rounds, VCs assume that companies like Uber have crazy market opportunities and need to scale yesterday. This is similar to the turn of the millennium when VCs assumed owning the online brand was salient investment goal. The difference is that today’s businesses have viable models so that, when a market correction comes, when the market realizes all these companies won’t scale to meet the investor’s fantastic needs, at least the companies will stay in business. VCs investors will have low returns, but the public markets are less likely to crash. 1.The emergence of the long-term effects of Moore’s Law that resulted in the development of the PC, which broke the IBM monopoly and democratized computing in ways we couldn’t imagine previously. 2.The maturing of the TCP/IP protocol (winning over the 7-layer bureaucracy) and the ability to easily connect to the Internet, which broke the lock-in protocol strategy of the 1970’s and was the foundation for the Internet explosion of the 1990’s. 3.The maturing of the relational database model, which dramatically speeded up software development and enabled the emergence of “big data” applications. Great analysis Jerry, nicely done amigo. And for the ´20s (in the 21st century!) the defining trend is how VC´s are taking VC-ing global. The likes of Sequoia are turning in their multiple-X´s far away from the Valley, the hedge funds types (Tiger Global) are placing even bigger bets in virgin territories (think India) and most interesting of all, local entrepreneurs are turning into VC´s (think Alibaba Group, Bharti Group) after doing their own IPO´s first. Thank you for this fabulous reading! Thanks for the writing and sharing mind. The logic stand point of technology risk and market risk is backed with induction and facts. Love this article.